Distant Worlds 2: WP2 "Anemones Botany Tour"
My home for the last week and soon the expedition will receive the coordinates for the next waypoint and we shall leave this place and jump into the darkness. So before we receive our marching orders I head out for a little tour around the surrounding system. This circuit has been established with discoveries of commanders CMDRs Mist0, Hanna Hunter, GenDeathrow, DocteurGui, Nozdus, Kazahnn Drahnn and Nathaniel Hawkwood, as well as with the help of Extools et EDSM databases. Distant Worlds 2: WP2 "Omega System"
Distant Worlds 2 Expedition arrived at the Omega system. Here we are working on 2 Community Goals to get a starport built near Sag A. These 2 CG's are for the basic construction materials for the starport. By the time the expedition arrived in the Sag A sector of the Milk Way, the super structure of the starport will have been built. Then another CG will be undertaken to improve the stations services. We have also been promised there will be basic mining modules at the station so we don't need to bring our heavy mining equipment all the way. Afew snap shots of the trip out here. Alien Pumpkins Hello Pumpkins, we come in peace. Another rocky moon Pretty sunrise on a rocky moon. Was pretty surprised at the port had a shipyard and a couple of decent ships in the shipyard. As soon as I docked up I bought a AspX and outfitted for mining. Needed to swap my FSD from Grease Monkey so I didn't have to be jumping alot just to get to the mining rings I'd heard about. Anyways didn't have alot cargo space so what I may end up doing is re fitting Grease Monkey for mining as I could get alot more cargo space than just 64T in the AspX where I had to keep dumping limpets as the asteroids where giving up alot of materials that are needed for the Distant Worlds 2 Mining CG. It was a busy night I could hear on the long range comms system. 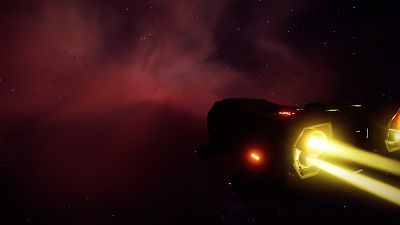 Hearing the CMDRs with excitement in their voices all wondering what they where going to find out in the deep dark black. There was a few reports of crimmals in the system destroying CMDRs as they entered. Most of the ships where easy pray as they where mostly exploration builds and without weapons for the most part. There was a few CMDRs providing protection for the wide eyed explorers but some did fall before they could even leave. Another reason why I didn’t launch with the rest for security as Grease Monkey is no combat ship in any form.